Is it me, or is HTC just plain interested in dipping their fingers into every gadget cookie jar out there? The smartphone company has certainly come very far since its Windows Mobile-powered days, and has since rolled out a fair number of flagship models on the Android platform that can be considered as ‘superphones’. Well, the tablet market is fair game, too, and HTC isn’t lost on the idea – hence introducing the HTC Flyer at the Mobile World Congress 2011 in Barcelona, Spain. At first glance, some people might think that the HTC Flyer has the Samsung Galaxy Tab trained in its sights, but surely that moving target is not worth the accolades, as the iPad is what all tablet manufacturers should be gunning for. Well, we will take a closer look at how the HTC Flyer fares in terms of specifications, and wonder how is it going to fare in the market. Since the HTC Flyer is a tablet, it goes without saying that HTC wil continue their partnership with Google by running Android on it, and of course, skinning it with a tablet-centric version of the HTC Sense. 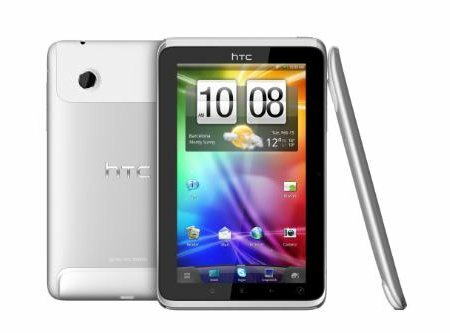 You will find it come in a sleek aluminum unibody that ought to move heads, helping the HTC Flyer tablet exude an iconic style and build quality that HTC is famous for. It won’t be heavy in your pocket either, being of the same weight as that of a paperback book, and has dimensions that should have it fit in a jacket pocket with ease. Other specifications include a seven-inch display, a lightning fast 1.5Ghz processor and high-speed HSPA+ wireless capabilities, making it quite the challenger on paper where specifications are concerned. Of course, touch interaction isn’t all there is to the HTC Flyer, since it will also boast the new HTC Scribe Technology that lets you rediscover the natural act of writing. HTC Scribe Technology will usher in a new era of integrated digital ink innovations which make it a snap to take notes, sign contracts, draw pictures, or even write on a web page or photo. Apart from that, the HTC Flyer tablet will also play nice with HTC Watch, which is actually HTC’s new video download service. This service delivers low-cost on-demand progressive downloading of hundreds of High-Definition movies from major studios. No idea on how much the HTC Flyer will cost, and which carrier will it be tied down to, but we do know that a global release is set to happen in Q2 2011.